politicalbetting.com » Blog Archive » Henry G Manson asks: Can Cameron win ethnic minority votes with candidates alone? Henry G Manson asks: Can Cameron win ethnic minority votes with candidates alone? According to reports yesterday the Conservative Party wants to increase its efforts to woo ethnic voters ahead of the election. This, alongside gay marriage, appears to be the second lesson George Osborne took from the recent US Presidential election. The Independent understands the initial aim seems to be to increase the number of minority parliamentary candidates. Conservatives currently have 11 MPs from an ethnic minority background compared to Labour who have 13. The Liberal Democrats, somewhat incredibly, have zero. It is worth reflecting on the fact that the Labour Party only has 2 more MPs than the Conservative Party despite taking pride itself on historically receiving much support from ethnic minorities and leading the way in new MPs in the late 1980s. Over the last 15 years Labour has concentrated on All Woman Shortlists in which black and Asian women have often lost. Attempts to rectify ethnic under-representation of MPs have stalled and there is a sense the party has been complacent in this area. All this does raise the question to what extent do the ethnicity of candidates affect voting intention? Despite having more diverse candidates and now almost the same number of ethnic minority MPs the Conservatives trailed by 68-16% to Labour among minority voters in 2010. What is to say that an additional 20 ethnic minority Conservative candidates in target seats will translate into the electoral support the Prime Minister hopes for? After all Labour’s biggest setback in 2012 saw a white George Galloway win strong support in Bradford East from Asian voters over a local Muslim Labour candidate. I can see a couple tactical problems for the Conservative leader to navigate if they are to go further than simply having greater ethnic diversity among their candidates. The first follows evidence that many UKIP supporters are more bothered by immigration than they are with Europe. The much awaited ‘Europe speech’ next month may not make the inroads into UKIP support that many Conservative MPs are looking for. They may soon turn to immigration as the area they want to raise up the political agenda in 2013 and for their government to address. It will be far from straightforward for the party to build ethnic minority support with an anti-immigration backdrop that can so often becomes a proxy for race in this country. To complicate matters further the Prime Minister already has a coalition partner much more relaxed about immigration to consider, an existing immigration target few think he will meet as well as vocal anti-immigrant elements within right-wing newspapers. However it could be the appointment of Lynton Crosby again as the party’s election campaign chief that holds most limitations. 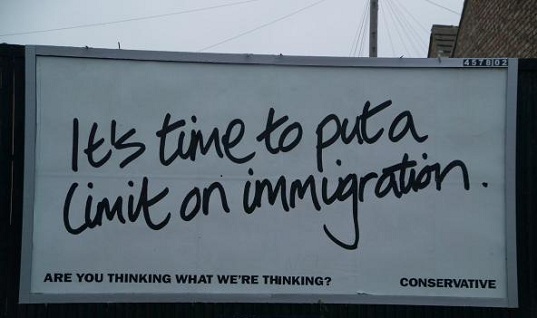 Crosby’s last general election outing in this country in 2005 produced the somewhat sinister “are you thinking what we’re thinking” posters on immigration and crime. The public responded with “not quite” and elected a third term Labour government despite an unpopular war in Iraq and widespread disillusionment with Tony Blair. More recently Crosby is reported to have urged Boris Johnson to spend less time try to appeal to ethnic minority voters and “f***ing Muslims” and to spend much more time aiming to appeal to traditional Conservative supporters during the latest London mayoral election. Is Lynton Crosby really the best guy to win ethnic minority support for the Conservatives? The trouble with so-called ‘dog-whistle’ approaches to race relations is that no-one else is meant to notice. On this score Crosby is already in difficulty. The Prime Minister may be better off making a bold political move for all to see and take a calculated risk. And given the Conservatives now accept they need to win greater support from women, Northerners and ethnic minorities doesn’t it seem curiously shortsighted for Baroness Warsi to have been ditched as Party Chairman at the last reshuffle? What signal did replacing her with the white, metropolitan and male Grant Shapps send out? What insight has been lost? A socially liberal Conservative PM and Chancellor now have the political need and opportunity to do something noteworthy in power for ethnic minority voters that goes well beyond boosting candidate numbers. What that ‘something’ should be is not yet clear.